TRAILHEAD ACCESS: From the 1-90 exits at Snoqualmie Pass, the trailhead is on the northwest side of the pass, off of the Alpental Ski Area Road. PARKING AND FACILITIES: Parking for 40 vehicles in the hiker parking lot, and for 8 vehicles with trailers in the horse parking lot. Facilities include toilets and a stock ramp. TRAIL: This section of the PCT begins at Snoqualmie Pass and goes north to its administrative end at Deception Pass. 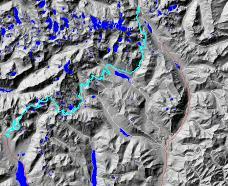 From that point to Stevens Pass, it is administered by the Skykomish Ranger District. The trail climbs on a gentle grade, switchbacking through stands of oldgrowth timber, then onto open talus slopes on the side of Kendall Peak. Crossing the spectacular Kendall Catwalk, the trail contours past Ridge and Gravel Lakes, stays above Alaska Lake, climbs over Alaska Mountain, contours above Joe Lake and climbs to its highest point on the side of Chikamin Ridge. 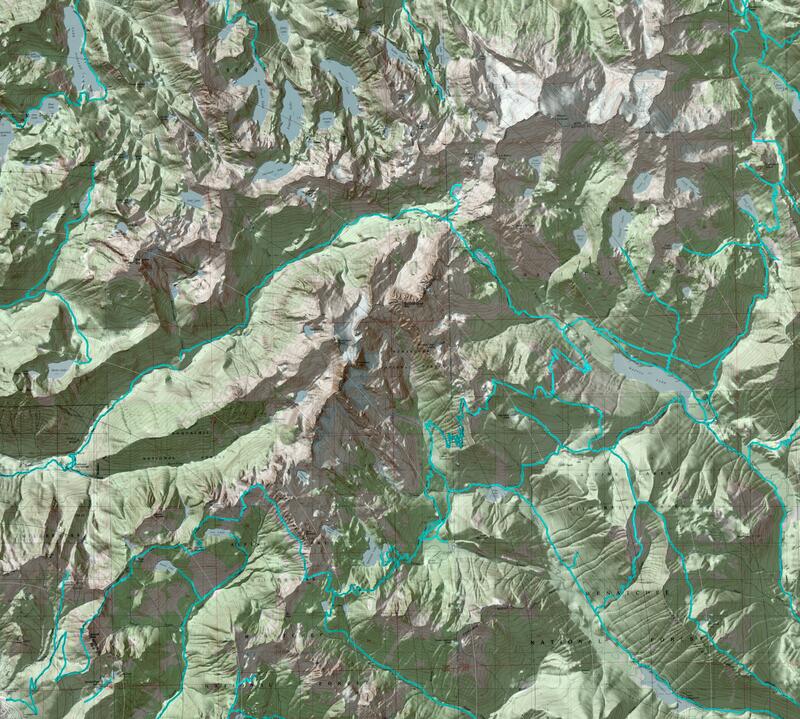 From this point it crosses the headwall of Gold Creek to Watson Pass. Please use designated campsites at Ridge and Gravel Lakes. Fires are prohibited above 5,000 feet. From the Catwalk to Watson Pass are several miles of trail on which it is dangerous for horses to pass each other. There are several other sections proceeding north on which pack strings travelling in opposite directions will have a difficult time passing because the trail is on very steep slopes, and in some cases carved out of almost vertical rock. From Watson Pass the trail descends towards Upper Park Lake. There is a stock camp above the lake, as the area around the lake is closed to stock. The trail then climbs higher onto Chikamin Ridge before descending past Spectacle Lake. There is access down to the lake via Spectacle Lake Trail #1306 (hikers only). Below Spectacle Lake, the creek cascades over a rock wall in a spectacular waterfall. The trail passes at the foot of this waterfall on a bridge. This is a good place to take a break and maybe some photos. A hiker trail known as “the Staircase” scrambles up to spectacle lake from north of the Bridge also. From the bridge, the trail descends to a flat area near Delate Creek, then contours at about 3200 feet elevation, to South Fork Lemah Creek, crossing on a bridge. The trail continues contouring about 1 mile to a bridged crossing of North Fork Lemah Creek. It follows this creek for about 0.75 mile, then begins a long series of switchbacks to Solo and Escondido Tarns on Escondido Ridge. The trail skirts high ~iround the basin of Escondido Lake and junctions with the Waptus Burn Trail. It then begins a 5 mile descent of long switchbacks, through the Waptus Burn (early 1900s), and crossing the Waptus River 2 miles above Waptus Lake on another bridge. The stretch through the burn is the brushiest on this trail, with the tread often being difficult to see due to salmonberry and other quick growing vegetation. From the Waptus River crossing, the trail stays on a gravel flat until the crossing of Spade Creek, which is also bridged. The trail then begins a very gradual climb through old-growth timber, staying just out of sightof Waptus Lake. Near the bottom end of Waptus Lake, it turns north into the Spinola Creek Drainage. It stays away from the creek, gaining elevation through a series of switchbacks, then topping out near the creek, with open views of the surrounding mountains, meadows and Spinola Creek. Although the creek is out of sight of the trail, there are several beautiful waterfalls in the first 0.5 mile below the basin. In the basin, the trail climbs at a more gentle grade, with few switchbacks, passing trail #1365 to Deer and Vicerite Lakes. Deer Lakes are about a 5-minute walk from the PCT, with Vicente another hour away. The trail continues past Spinola Meadows, where horse camping is available, and on to near the outlet to Deep Lake. This lake is situated at the base of Mount Daniel and Cathedral Rock with a large meadow at the outlet. There are restrictions on campfires and stock tethering near this lake. The trail crosses Spinola Creek, then begins a series of long switchbacks onto Deep Lake Ridge at Cathedral Pass. On each side of the pass are junctions with the trail to Peggy’s Pond #1375 (hikers only), and Cathedral Rock Trail #1345. Trail #1345 is the PCT alternate, due to early season high water at Mt. Daniel ford. This trail descends to the trailhead at the end of FS Road 4330, and then as an alternate, follows trail #1376 past Hyas Lake and again joins the PCT at Deception Pass. From the junction with trail #1345, the PCT descends on the north side of Cathedral Rock to the Mt. Daniel ford. The ford is difficult to cross in the early season and after heavy rainstorms, due to swift water and a changing bed. From here the trail begins a steady ascent to its administrative end at Deception Pass. 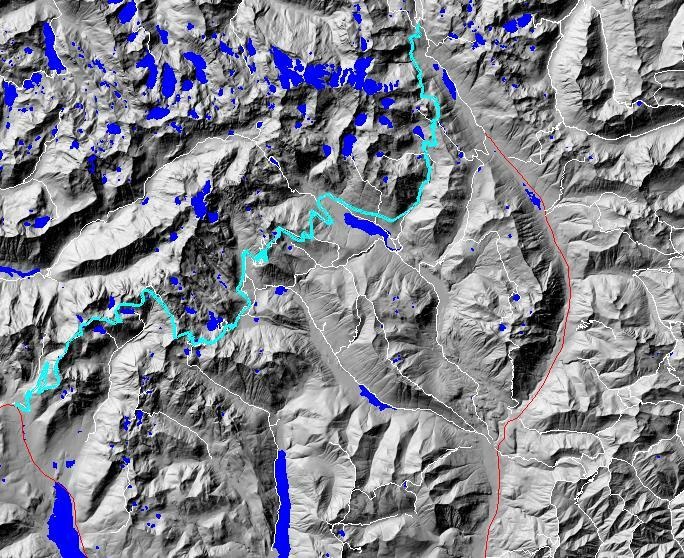 SETTING:	Old-growth timber, subalpine zone, lakes, streams, mountains, ridgetops, meadows, open hillsides, cliffs. OPPORTUNITIES:	Hiking, horseback riding, mountain climbing, scenery, photography, fishing, camping, backpacking, berry picking, hunting, wildlife.